Options: Sea Urchin Vase; Sm. Sea Urchin Vase; Med. Sea Urchin Vase; Lg. 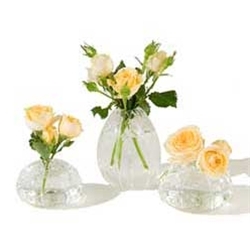 An assortment of hand blown glass bud vases. Each is inspired by real sea urchin shapes and markings. Item No. 1948 Sea Urchin Vase; Sm. Item No. 1964 Sea Urchin Vase; Med. Item No. 1984 Sea Urchin Vase; Lg.